As I paid for my pomegranates at the local grocery last week, a fellow shopper asked, “What do you do with that?” I’ve been eating pomegranates for years and don’t think much about their strangeness anymore, but I understand the lady’s curiosity about the fruit. The leathery exterior of the pomegranate doesn’t even hint at the deliciously juicy, sparkling little jewels inside. Beneath the rind, the fruit is densely packed with small white seeds, each enveloped in its own bright, clear packet of juice, somewhat like orange pulp inside an orange segment. As much as I am delighted by the flavour and visual appeal, what most impresses me about the pomegranate is what it can do for our health. As a disease fighter and health promoter, this fruit is an absolute powerhouse. Here’s what research has found. Scientists took some cancer cells from men with highly aggressive prostate cancer.1 The cells were allowed to grow in tissue cultures in the lab. 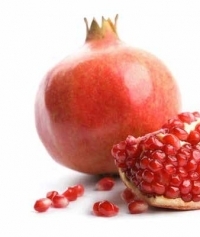 When extracts from pomegranate were added, the growth of the cancer slowed. The researchers then took those aggressive cancer cells and injected mice with them. The mice that got pomegranate juice in their drinking water developed significantly smaller tumors than mice that didn’t get pomegranate juice. Pomegranate juice is also beneficial for those with coronary heart disease. Another study found that patients who drank eight ounces of pomegranate juice each day for three months had better blood flow to the heart.2 Pomegranate may help prevent plaque build-up in arteries. Osteoarthritis is a painful disease that results from the breakdown of cartilage in the joints. Scientists studying osteoarthritis are also interested in what pomegranate can do for those suffering from this disease. Early research has had promising results.3 Laboratory tests showed that pomegranate extract blocked the production of an enzyme that destroys cartilage. Scientists attribute pomegranate’s health benefits to the fruit’s powerful antioxidants. Pomegranates are in season from November to early spring, so get them while you can! The best way to eat a pomegranate is to cut away the top at the shoulder on the flower end. Locate the ribs inside (the seeds are arranged like orange segments). Score the peel down the ribs, then push your thumbs into the centre at the top and pull the pomegranate apart. This way you get chunks of seeds arranged in large segments and have much less membrane to pick at to get at the seeds. If you’ve got internet access you can see a demonstration of this on YouTube. 1. 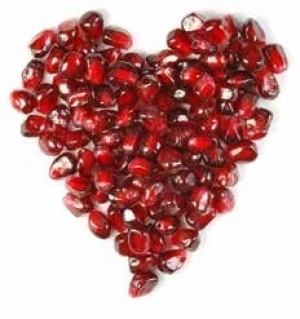 Harvard Health Publications, Harvard Medical School, “Health benefit of pomegranate juice on prostate cancer and the heart,” http://www.health.harvard.edu/press_releases/health-benefit-of-pomegranate-juice (Accessed January 22, 2014). 2. Michael D. Sumner, Melanie Elliott-Eller, Gerdi Weidner, Jennifer J. Daubenmier, Mailine H. Chew, Ruth Marlin, Caren J. Raisin, and Dean Ornish, “Effects of Pomegranate Juice Consumption on Myocardial Perfusion in Patients With Coronary Heart Disease,” The Ornish Spectrum, http://www.ornishspectrum.com/wp-content/uploads/Effects-of-Pomegranate-Juice-Consumption-on-Myocardial.pdf (Accessed January 22, 2014). 3. Hadipour-Jahromy M, Mozaffari-Kermani R., “Chondroprotective effects of pomegranate juice on monoiodoacetate-induced osteoarthritis of the knee joint of mice,” PubMed.gov, http://www.ncbi.nlm.nih.gov/pubmed/19504467 (Accessed January 22, 2014).